First row on August 25, 2012. Felt fine but different than double and Maas and a little surprising. The slide seemed short. With my foot stretchers all the way short, I still hit the front stops. Most notably the rigging seemed quite low which makes it difficult to get my hands away at the finish. 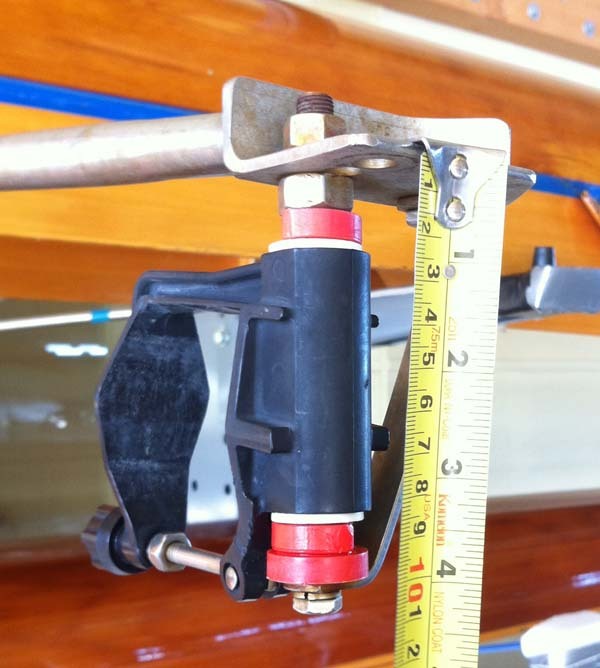 The oar locks are 4-3/4" above the seat, 8-1/4" above the deck and 11-1/4" above the keel. By comparison the double and Maas locks are about 6" above the seat. Also there is a noticeable rake or caster or lateral pitch to the oar lock pins - maybe four or five degrees - whereas with all the other boats the lateral pitch seems to be about zero. 1) get oar locks like Steve is putting on the new boats which have room to add spacers under the locks. 2) Shim the riggers up with wedges which would also reduce the lateral pitch. Thank you once more for your hospitality, including the use of your shell. Which is my reason for writing. I rowed a few miles this morning and immediately noted that my oarlocks were too low for comfort, compared with your boat. 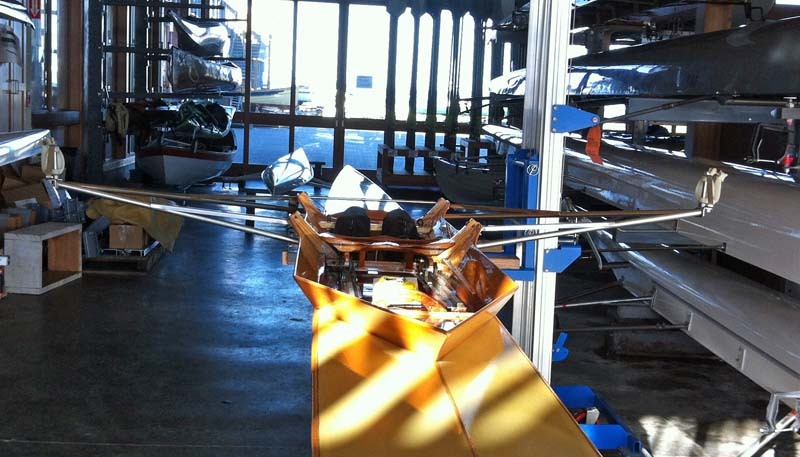 I felt I was straining my wrists near the finish, so I put one more spacer under each oarlock. That felt normal and quite comfortable. Later I measured the height above the seat at 5-1/4”. 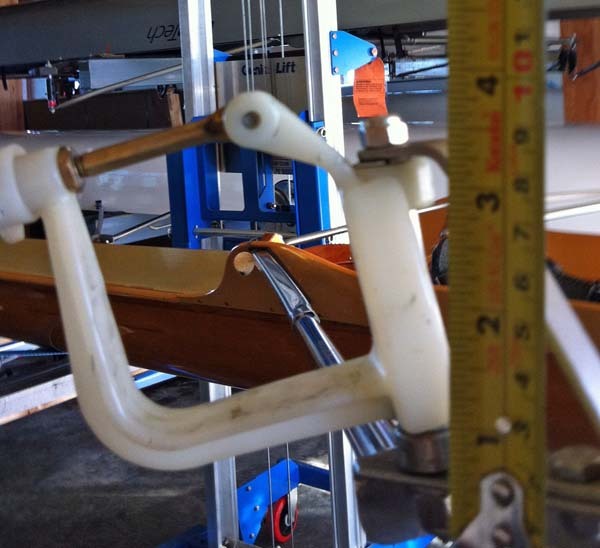 The measurement was taken from the highest center point of the stern side of the seat to a bar spanning the oarlocks. Had I used the lowest part of the seat, the distance would be up to ½” greater, and it would be a more universal measurement point. When we talk height above seat, we need to specify the measuring point. I still feel that your rig is a bit high for my body, though the wedges under your tracks compensate as you approach the bow end of the tracks. I was surprised at how I easily accommodated your higher rig, and how cramped my rig felt today. I encourage you to try a lower rig, yet always keep comfort in mind, not the opinion of someone else. Also, my boat’s spread is 60", which I know to be ½"- 1" less than most LWRC club boats. I hope you all enjoy the next two coaching sessions, which will be with Margaret. I told her briefly what we had done. Copyright 2005 - 2017 All rights reserved.